When it comes to feeding all dogs are different, not only in their preferred foods, but also in how they eat. Some dogs struggle when their food bowls are on the floor, and many more can benefit from having their bowls raised. There are many raised dog bowls on the market, all offering different heights and types of stands, so how do you know which is best for your beloved pet? Our panel of pet experts and dog lovers have put together this list of the best raised dog bowls to help you make the right choice for your dog. Comprised of two stainless steel bowls and a sturdy plastic frame the Pet Zone Designer Diner Adjustable Elevated Pet Feeder is the perfect answer to feeding time for dogs of all sizes. The elevated feeder is adjustable meaning that you can use the same feeder as your dog grows, without worrying about staining their neck and joints. The feeder collapses flat for easy transportation and storage. It includes spill ridges to help keep your dog’s food where it should be and non-slip feet to prevent it from sliding across the floor as your four-legged feed tucks into their dinner. Available in two different heights the Elevated Pet Feeder in Premium Solid Wood by Pet Fusion is made from responsibly sourced natural pine. The wood is covered with several layers of water resistant seal to keep the feeder in top condition and to make it easy to clean. 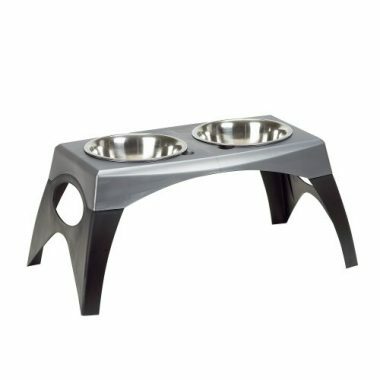 Plastic inserts help to stabilize the two stainless steel food bowls, while anti-slip feet ensure the feeder stays still while your canine companion is eating. 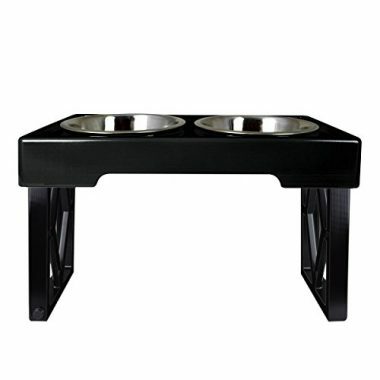 The Elevated Bone Feeder Raised Dog Feeding Station from Our Pets is available in four different heights to meet the needs of all breeds of dog. 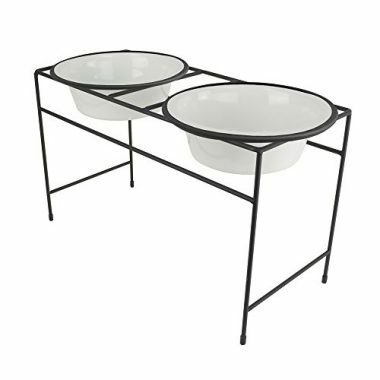 The bone shaped table is made from sturdy plastic and includes two removable stainless steel feeding bowls. 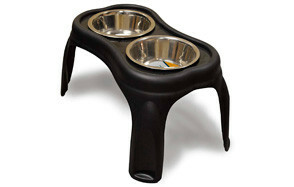 The table includes spill ridges to help stop food and water from spilling onto your floor while your dog is eating. The IRIS Small Elevated Feeder by IRIS USA, Inc, is a uniquely designed elevated feeder that comprises a feeding station and food storage container, which sits under the feeder. The airtight storage keeps your pet’s food safe and fresh, while the two stainless steel feeding bowls sit at the right height for your dog. The feeding station snaps into place with two snap-lock latches and the bowls are removable for easy cleaning. The rubberized feet on the base of the storage box prevent scratches to your floor and stop the feeding station from moving and sliding. Made from BPA-free injection molded plastic, the Bergan 88142-P Elevated Double Bowl feeder is ideal for older dogs and those that have difficulty bending. It comes with removable legs, so you can change the height if needed or store the item when not in use. 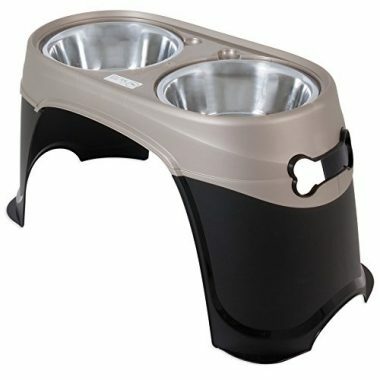 The feeder includes two stainless steel removable bowls that each hold up to 6 cups of dog food. 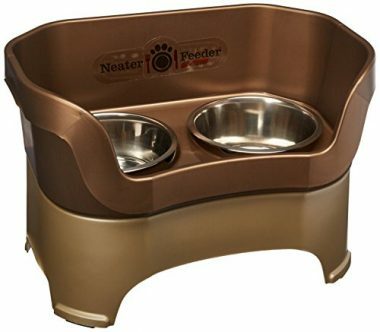 If your dog is a messy eater and you want to avoid having food all over your floor, then the Neater Feeder Deluxe Dog feeder by NEATER PET BRANDS is the elevated feeder you need. It is specifically designed to be kick proof and spill proof and has a built-in reservoir to capture spills and stop them ending up all over the floor. The high back and side prevents food scraps from escaping and the lip at the front also reduces spills without preventing easy access to the food. Extended legs can be purchased separately to further increase the height of the feeding station. Non-slip feet come as standard with the feeder to ensure it stays where it is meant to be. The Healthy Pet Diner Elevated Feeder by Our Pets is made from robust plastic and designed in a shape that adds to its sturdiness, making it harder for your dog to tip over while they are eating. The feeder includes two stainless steel bowls that are removable, easy to clean and dishwasher safe. One of the bowls can be replaced with any two-liter water bottle to provide a constant stream of fresh water. The EZ Reach Diner from Petmate offers ergonomic feeding for your canine companion to support their digestive system and take the pressure off aging neck joints. Made from durable plastic the feeder includes two removable stainless steel feeding bowls. The design includes cut out handles to make the feeder easier to transport. 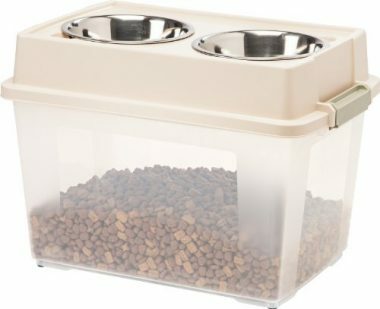 The Double Diner Feeder with Stainless Steel Cat / Dog bowls comes in five sizes and so is able to accommodate the needs of most pets. The stand is created from high-quality wrought iron, complete with non-skid feet at the base of each leg to reduce the risk of the feeder moving. 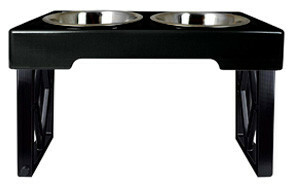 The feeder includes two removable stainless steel, powder coated bowls that are scratch, chip, rust and fade resistant. The dishwasher safe bowls sit in the frame surrounded by a silicone rim that provides rattle free feeding for a better experience for both pet and owner. 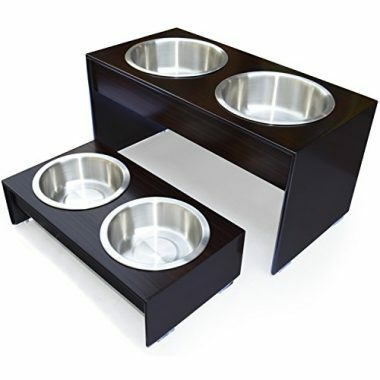 This elevated pet feeder differs from others as it only contains the one feeding bowl. 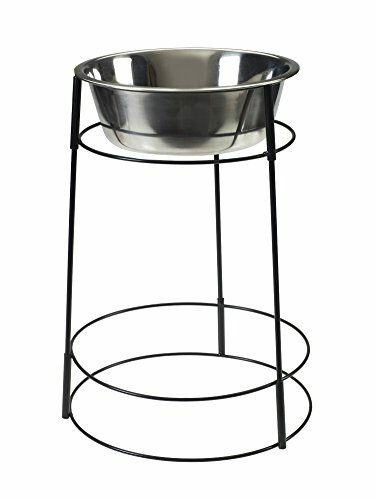 The Ethical Pet Spot Hi-Rise Single Diner is designed for medium, large and giant dog, with the 8-cup stainless steel bowl standing 15” from the floor. The bowl stand is made from lightweight, durable wire. It is easy to move, while the bowl is removable, naturally bacteria resistant, and dishwasher safe. Our list shows a wide array of raised dog bowls, all with their own specific features and benefits. However, there are some key elements that are present in all the best raised dog bowls and in this part of our buying guide we explore these elements in more detail. We also explore some of the questions that elevated dog bowls may raise and provide answers that hopefully help you in your decision-making process. Elevated dog bowls are available in a range of heights and it is important to get one that is the right height for your dog. If it is too low then they will not gain any benefit from it, if it is too tall then it may add to, rather than reduce, the stain on their neck and joints. To ensure the bowl is the right height get your dog to stand upright and measure their height from the floor to the front of their shoulders. Experts such that you should then subtract seven inches from this measurement to get the height of the feeder you need. The raised dog bowl that you choose needs to be stable and durable. If it is easily knocked over or moves while your dog is eating, then it will reduce the effectiveness of the feeding system and cause a lot of mess. Choosing a raised dog bowl that has non-slip feet helps to keep the system still while your dog is eating and helps to prevent scuffing and scratching on your floors. Removable and washable feeding bowls are a must. The best raised dog bowls include stainless steel feeding bowls that are dishwasher safe and reduce the risk of bacteria growth over time. 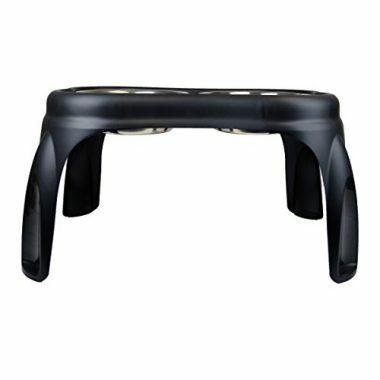 The material that the stand is made from is also important durable molded plastic is easy to wipe clean as are metal stands. If you choose a wooden stand then ensure that it is sealed with a water proof sealant to make cleaning easier and eliminate the risk of liquid and particles of food being absorbed into the wood. Dogs need a source of fresh water available at all times. This is even more important if you feed them dry food. 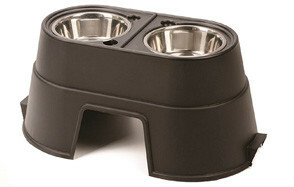 Most raised dog bowls contain two bowls allowing for food and water to be available at the right height. If you choose a one bowl system, then you need to consider where you are going to place their water. The size of the bowl you need depends greatly on your dog’s eating habits, as well as their face shape. If you feed your dog smaller regular meals, then you can use a smaller bowl. However, deeper bowls are recommended for larger dogs and those with long snouts. For snub nose dogs a shallow bowl may be more appropriate. Q: What Type of Bowl Should I Use to Feed My Dog? A: All the bowls that come as part of the feeding systems on our list are stainless steel. There is a very good reason for this, namely they are easier to keep clean and less likely to cause allergic reactions in your dog. Plastic bowls are another common option, but they can be easily scratched or chewed, the resulting damage can attract bacteria, causing illness over time. Plastic bowls can also cause allergic reactions in some dogs. Ceramic bowls are not recommended for raised feeding stations as they can be heavy and break easily if dropped. Again, bacteria can build up in small cracks and chips. Q: Why Opt for an Elevated Dog Bowl? A: When dogs eat from floor leave they need to bend their head and neck to reach their food. This can put a great deal of pressure on their necks and other joints. This is a particular problem in older dogs and larger breeds. 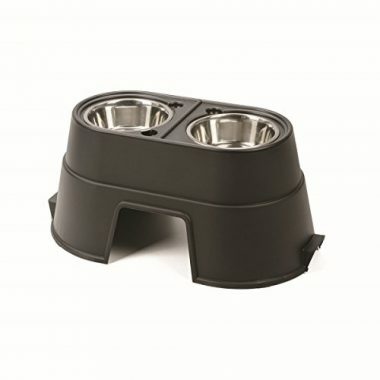 Elevated dog bowls, when at the right height for your dog, prevent this straining and relieve pressure from the joints. Many dog breeds gulp their food, and when this occurs at the angles required for feeding from floor level, they can take in air as they eat. This can lead to digestive issues including excess gas, indigestion and vomiting. This problem can be reduced when the food is placed at the right height for your dog. Feeding from an elevated dog bowl can also reduce the mess and spills that are a common problem when feeding at floor level. More of their food stays in the bowl and less water finds its way onto the floor, reducing the risk of accidents for both you and your dog. Q: Do Raised Dog Bowls Prevent Bloat? A: Many raised dog bowl systems state that they help to prevent or reduce the risk of bloat in dogs. However, there is veterinary evidence to suggest that this might not be the case. There are numerous things that can cause bloat, including gulping food. However, some experts suggest that raising your dog’s food so that it is closer to their mouth can also increase the risk of bloat. There are very few comprehensive studies on this area of feeding and of those that exist only one suggests that there is an increased risk of GDV. Even within this study the exact height of the bowl and the size of the dog were as much determining factors as the fact that the bowl was raised at all. Other experts consider that raising your dog’s food to a more natural height can actually reduce the risk of bloat. While there is evidence to suggest that a raised bowl can support digestive health generally, and aid with some other digestive complaints, there is little evidence available to back up the claim that raised bowls reduce the risk of Bloat. There is no definitive answer to whether raised dog bowls prevent bloat. Regardless of how you feed your dog, you should be aware of the signs and seek medical assistance from your veterinarian if you suspect bloat. If you are unsure whether a raised feeding system is right you’re your dog, then seek advice from your veterinarian and then follow our guide to ensure you choose the best available for your dog’s specific needs.